When do you know your nation's in trouble? When one of its leading telecommunications company dedicates a rather expensive mass campaign (both on press and outdoor) to reach NOT a typical Malaysian with a household income of RM2,500 and above, but rather, to reach another apparently growing source of business. I couldn't believe my eyes when I saw this campaign. 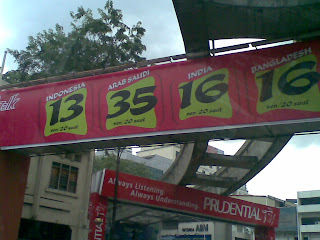 A multi-hundred thousand ringgit campaign like this indicates just how big this target market has become. Not because of their spending power, but because of their sheer, bloody masses. Yeah, seems like we're doing a GREAT job of controlling the tide of foreign workers. So great that telecommunications industries have acknowledged the existence and importance of this target market enough to spend money communicating promotions to them. Have you ever seen MASS media campaigns targeted at Vietnamese in Australia? Call home to Vietnam for less than 5 cents a minute. Or in Singapore, to the masses of Filipinos working there? At best, stuff like this is targeted to areas where they hang out. But, in Malaysia, it was a MASS media campaign, which shows just how bad it's gotten. Thanks for the bad restaurant service. Thanks for the robberies / break-ins. Thanks for making me feel afraid to walk in my neighbourhood after dark.